Georgia has developed a transition plan in response to gradual reductions over the years to its allocations from the Global Fund. The goal of the Georgia Transition Plan is to ensure a smooth transitioning to full domestic funding of the HIV and TB programs by 2022 without compromising services. However, the plan does not specify which services the government is taking over or when. The Georgian CCM provided Aidspan with a copy of the transition plan. This article describes the contents of the plan. It also provides some analysis (see especially the section at the end of the article). This is the first time that Aidspan has written about the contents of a transition plan. 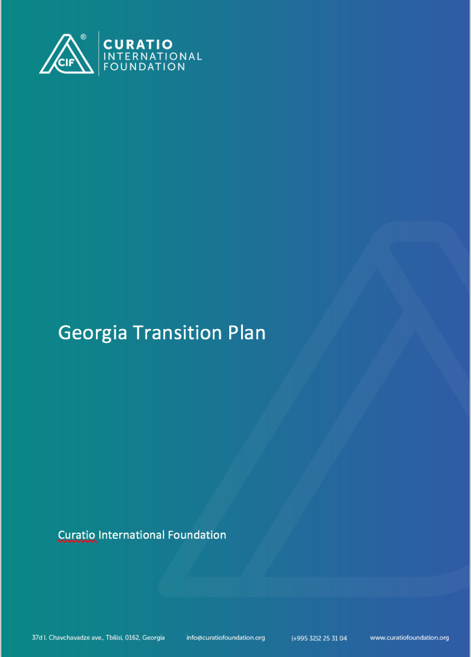 In addition to a 48-page narrative document, the Georgia Transition Plan includes three annexes: (1) a responsibilities matrix and timeline; (2) an M&E framework; and (3) a budget. In preparing the plan, Georgia has chosen to assume that the Global Fund will pull out entirely by 2022, which is the year that Georgia’s grants from its 2017-2019 allocation are expected to end. Georgia has made this assumption even though the country is not on the Fund’s list of components expected to transition from Global Fund support by 2025. Editor’s note: Georgia received an allocation for 2017-2019 for HIV and TB. If Georgia were to be informed sometime in the next couple of years that the Global Fund was planning to withdraw completely, the country would still be entitled to receive “transition funding” for the 2020-2022 allocation period. Under current rules, a component that has been identified for transition is entitled to receive one last allocation from the Global Fund. However, this allocation is supposed to be used solely or primarily to defray the costs of implementing a transition plan. In 2015, Georgia conducted a transition readiness assessment (TRA) (see GFO article). The transition plan builds on the TRA. The plan lists all of the problems identified in the TRA and covers those that are not being addressed either by the Global Fund or the national HIV and TB programs. The CCM advises that the Georgia Transition Plan should be read together with the documents describing the national TB and HIV programs and the country’s most recent requests for funding to the Global Fund. The Transition Plan describes (a) the problems that have to be addressed in order to ensure a successful transition; and (b) the activities that will be implemented to resolve the problems and gaps. Preparation of the Georgia Transition Plan was initiated by the country coordinating mechanism (CCM) and the National Center for Disease Control and Public Health, the principal recipient (PR) of the Global Fund grants in Georgia, with funding provided by the Global Fund. The plan was developed by a team of independent consultants (Curatio International Foundation). According to the transition plan document, all stakeholders were actively involved in the development of the plan, including the Policy and Advocacy Council (PAAC), the body specifically established to assist the CCM with the transition of the HIV and TB programs. The process of preparing the plan was agreed with the Global Fund’s fund portfolio manager. The Global Fund Secretariat commented on a draft of the plan, and the final plan was endorsed by the CCM. The plan is structured around two group of problems, those that have to do with the external environment – defined as not directly related to the health system but still significantly affecting its development; and those that are related to the internal environment, i.e. directly connected to the health system. With respect to the latter, the transition plan describes problems in the following areas: financial resources, human resources, health information systems, governance, reporting, services, procurement and organizational capacities. Below we provide information on some of the problems identified in these areas, and some of the activities that the plan says will be implemented to address the problems. According to the Georgia Transition Plan, civil society organizations (CSOs) are currently restricted in their ability to participate in government tenders. For example, most service provider CSOs find it difficult to meet the requirements of the Public Procurement Law to present a bank guarantee worth 1-2% of the total budget of a tender proposal. The plan said that there may also be other regulations that hinder the participation of civil society. To address this problem, the plan calls for the procurement law and relevant regulations to be reviewed to identify the barriers to CSO participation in the state tenders; and for measures to build the capacity of CSOs, their networks and coalitions to satisfy the state procurement requirements. The capacity building should include training and technical assistance in management and resource mobilization, the plan stated. The transition plan declares that “it is … important for the state to be able to sign contracts with NGOs as [the] non-governmental sector is a very important player in effective implementation of preventive measures.” The plan calls for the development of a detailed operational manual describing the rules and procedures for contracting CSOs for health service delivery. According to the plan, restrictive drug policy remains a significant barrier to successful implementation of the HIV program. The plan says that this problem has to be resolved before the Global Fund financing ends. The plan calls for increased coordination among key stakeholders, relevant government bodies, parliamentary committees, civil society and the National Platform on Drug Policy Reform (see GFO article) to change the country’s drug legislation by developing and enforcing a new four-pillar drug policy, anti-drug strategy and action plan. Not surprisingly, the biggest problem is the increasing financial gap being created by the gradual reduction of the Global Fund support. For example, despite the existence of defined state obligations, the implementation of Georgia’s national TB strategy (2016-2018) is running “in the red”; the funding gap is estimated to be above 20%. In addition, the transition plan said, the financial obligations of the Ministry of Labor, Health and Social Affairs (MoLHSA), which manages both the HIV and TB strategies, is likely to exceed its budget. The plan calls for the timely identification of internal and external opportunities to avoid interruption of the programs due to financial gaps. The plan includes several activities designed to increase efficiency. One example of this is the introduction of a result-based financing (RBF) system for the TB program. Georgia believes that this is a suitable activity for inclusion in the transition plan because the government would have clear guidance on how to spend its money wisely (and potentially spend less, and spend for results). A critical problem for both the HIV and TB programs is that health care staff don’t have sufficient skills. To address this problem, the transition plan calls for the development of a policy that defines the professional competences required – for medical and other staff, as well as for workers in CSOs. It also calls for institutionalizing TB and HIV training programs and integrating them into the relevant formal education system (undergraduate and postgraduate). According to the transition plan, HIV data collection is not standardized because it is not segregated by age and gender; the HIV and TB information systems are not fully integrated into Georgia’s national information system; and statistical data are not regularly analyzed and used for decision-making. To address these problems, the plan calls for monitoring and evaluating existing HIS strengthening interventions as well as current processes to fully integrate advanced surveillance, monitoring and reporting systems. It also calls for staff to be trained on the use of the HIS. In addition, regarding the TB program specifically, the plan said that program management functions and responsibilities are not clearly defined, which causes program fragmentation and makes achieving sustainability more difficult. The plan calls for strengthening the organizational capacity of the TB program by adopting a legal document that clearly defines functions and responsibilities for program management. This could take the form of a Government of Georgia resolution or, possibly, changes to the TB Law. The plan states that although the CCM has been the major body coordinating the national response for both HIV and TB, it is not well placed within the government hierarchy, and thus lacks legal power to assure effective coordination across different sectors. According to the transition plan, there is unanimous consensus that the CCM should continue its operations after the Global Fund withdraws its support. During the transition phase, the plan states, various options will be discussed concerning how the CCM should evolve; the optimal option will be selected; and a plan will be developed to implement the selected option. The transition plan said that currently there are no official channels for dissemination of the HIV or TB program information and financial data. Detailed information about costs are not available, which restricts the ability of CSOs to carry out advocacy activities and the ability of different stakeholders to monitor the programs. To address these problems, the plan calls for the government to establish a system of health accounts during the transition that will allow for publicly available HIV and TB expenditure reports to be produced and for spending analyses to be conducted annually. Concerning the TB program, the transition plan calls for a gradual shift towards a people-centered TB case model to avoid unnecessary hospitalization and improve efficiency of the system. Currently, the procurement and supply of health products for HIV prevention and treatment in Georgia is managed by the National Center for Disease Control and Public Health (NCDC). Antiretrovirals are purchased through the Global Fund’s pooled procurement mechanism (PPM). The procurement and supply of health products for TB treatment is also managed by the NCDC. First-line drugs are procured through the state’s procurement mechanism, while second-line drugs are procured through the PPM. No decision has been taken yet concerning whether the NCDC will continue to manage the procurement and supply chain function after the Global Fund withdraws. Shifting responsibility for this function to the Social Service Agency (SSA) is possible because the SSA procures health commodities for other national health programs. The transition plan calls for selecting the agency that will be responsible for procurement and supply chain management; and conducting capacity building of the agency selected (if a new entity will take over from the NCDC). The transition plan states that because the national TB Program does not have a formal management structure, program continuity and sustainability risks are high. In November 2014, the Ministry of Labor, Health and Social Affairs (MoLHSA) created a new department, the National Tuberculosis Council (NTC), to be responsible for TB program management. The transition plan says that in order to improve management and coordination of the national TB Program, the organizational capacity of the secretariat of the NTC will need strengthening. Thus, the plan calls for capacity building activities to enhance the ability of the NTC secretariat to provide operational and secretarial support to the NTC. Georgia estimates that the cost of implementing its transition plan is $2.4 million over five years (2017-2021). According to the plan, a potential funding source was identified for the operational expenses for the transition’s plan proposed M&E unit starting from 2018 ($96,000 over the period from 2018-2021); and external funding sources have also been identified for the activities under the objective “Create conducive legal environment for HIV national response” (cost: $29,200 over the same period). All other funding is expected to be provided by the Global Fund in the form of a transition grant. Because they found the transition plan quite complicated and difficult for communities to understand, CSOs in Georgia developed a user-friendly version of the plan (with funding from the Community, Rights and Gender department of the Global Fund Secretariat). On 1-2 June 2017, the Eurasian Harm Reduction Network (EHRN) organized a workshop to review and discuss the transition plan, and develop strategies to monitor the implementation of the plan. The report of this workshop said that the transition plan cannot be viewed in isolation, but rather should be considered in conjunction with the national strategic plans for TB and HIV, as well as Georgia’s most recent funding requests to the Global Fund for TB and HIV (for the country’s 2014-2016 allocation.) The report said that monitoring the implementation of the transition plan requires a deep understanding of all of these documents. The report said that the user-friendly version of the plan is a useful monitoring tool, not only for communities, but also for the program implementers. Finally, participants stated that if the CCM did not continue to function beyond the withdrawal of Global Fund support, it would be difficult to maintain the involvement of the communities in the process. Gabunia added that “the implementation of the TSP should be closely monitored by CSOs and community representatives. A mechanism will be established to facilitate monitoring – a mechanism that will not only help to identify implementation problems but also provide an appropriate response,” she said. In the absence of guidelines (or a template or model plan) from the Global Fund concerning what should be included in a transition plan, countries are left to their own devices to figure out what their plan should contain. As others have noted, the Georgia Transition Plan is complicated and not easy to understand. One of the reasons it is not easy to understand is that to obtain a complete picture of what Georgia is planning for the transition, one has to read not only the Georgia Transition Plan, but also the country’s national strategic plans for TB and HIV, and Georgia’s most recent funding requests. We understand this, but we can’t help feeling that a transition plan should be able to stand on its own. Georgia’s most recent funding requests are the concept notes that were approved in 2016 with funding from the 2014-2016 allocations. There is a problem with relying on the concept notes for a description of the programs being implemented. After they are submitted, the concept notes are reviewed by the Technical Review Panel and the Grant Approvals Committee. Clarifications are sought which result in changes to the programs described in the concept notes. This is followed by the grant-making stage, during which more changes are made to the proposed program. The final approved program can look quite different from the original concept note. But there is no one document that describes the final program. We expected to see a list of the services for which the government is assuming responsibility, and a timetable for when this will happen. But there is almost none of this in the Georgia Transition Plan. We would have expected to see a section of the transition plan describing how the government is going to pay for the costs of antiretroviral treatment. However, Aidspan understands that Georgia’s National HIV Strategy already commits the government to covering the full costs of ARVs. This explains why there is nothing in the transition plan about ARVs. It also underscores what stakeholders are saying about needing to consider not only what is in the plan but also what is in the national strategy and the latest Global Fund requests for funding. There were many items in the Georgia Transition Plan that did not appear to have anything to do with transition. For example, the plan calls for several activities to be implemented to strengthen the national TB program. This is something that Georgia should be doing, transition or no transition. However, while such items may not be directly related to transition, stakeholders in Georgia may consider that they are necessary for longer-term sustainability of the country’s TB and HIV programs. Some actions that do not appear to be directly related to transition can nevertheless make transition easier. For example, the Georgia Transition Plan calls for a gradual shift towards a people-centered TB case model to avoid unnecessary hospitalization and to improve efficiency of the system. This action will bring costs down which, in turn, will make it easier for the government to take over provision of these services.